The 125cc segment has always been considered the premium end of the commuter motorcycle business, but unlike the 100cc segment it has not had a clear market leader. Several manufacturers have tasted success, like Honda with the Shine and Bajaj with its Discover but none have been able to better their competitors by a significant margin. TVS had been conspicuous by its absence after the Flame, and are now back to regain lost ground with their new Phoenix 125. We rode it at TVS's in-house test track at Hosur two month's back and came back impressed  the engine and handling seemed to make it fun to ride at the track. We were however unable to assess it in the real world, which is the real battleground for the Phoenix. 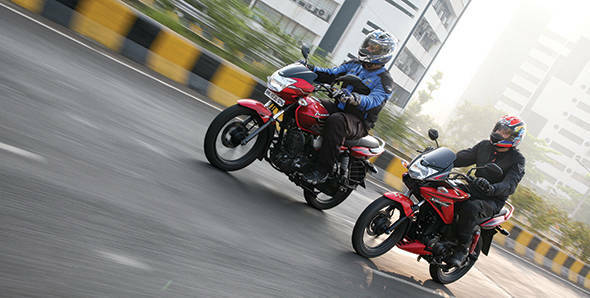 TVS has billed the Phoenix as a 'premium' 125cc commuter and now that we have the motorcycle with us we decided to pitch it against our all-time favourite 125, the Honda CBF Stunner which has held its ground as a high-end 125cc motorcycle for long. TVS have played it safe with the Phoenix's styling package. They have gone the conventional way with a bikini fairing and simple body panels. It does not break any new ground in the styling department but looks fresh, especially in the red colour that our test bike wears along with the black powder coated engine. There are hints of the Apache in several places, though the stickering does a great job of hiding those cues from you, and giving the Phoenix an average look. The fairing looks plain in comparison to the more flashy designs you see on new-age motorcycles, but tries to look elegant with its curvy lines, and houses two parking lights. The design language continues onto the fuel tank  unlike most new motorcycles it does not get knee recesses. The single piece seat is flat, while the body panels and the tail light are all elements that do not stand out and look conventional. Interestingly, the graphics on the fuel tank are quite in contrast and are the only bits on the Phoenix that try to look sporty. The Stunner's styling on the other hand is sporty, with its half fairing and stepped seat. Despite it being launched four years back, it looks appealing, especially to those looking for a commuter that looks larger than a 125. For that matter, it is more accommodating for taller riders as compared to the Phoenix, an advantage for this Honda. Unlike the Phoenix the Stunner's lines are sharp, and there's a hint of aggressiveness in the styling, which has made the Stunner popular with those youngsters who want a flashy yet affordable machine, even though its simpler looking sibling Shine continues to be the largest selling 125 in the country. The all-digital clocks on the Phoenix look more modern, but are slightly confusing  the circular digital display is the speedometer and not the tacho, and this takes some getting used to and there's no tachometer at all. The Stunner's clocks on the other hand look routine, with a twin-pod layout but have an analog speedometer and tachometer both, and are simple and lucid. Build quality and the quality of switchgear and levers on both bikes is impressive. Fit and finish levels are good as well, and both bikes have a solid feel. The Phoenix being the latest entrant in the segment has had the opportunity to check what the competition has, and TVS have tried to offer the best possible figures. Before the launch of the Discover 125ST the Stunner was the most powerful 125 with 11.1PS of power produced at 8000rpm and 11Nm of torque produced at 6500rpm. The Phoenix matches those figures  11PS at 8000rpm and 10.8Nm at 6000rpm, 500 revs lower than the Stunner. TVS say their new Eco-thrust engine is almost new and uses a high capacity clutch along with various other improvements. This is evident the moment you thumb the starter, as the engine sounds and feels refined. It has a sense of urgency and is quick to respond to throttle inputs. Refinement levels are excellent and it does not feel buzzy at any point in the rev band. Even when ridden hard there's no vibration. This makes the Phoenix an able machine in traffic and its adequate gear ratios get the job done without having to keep working the gearbox. There's enough torque available for overtaking even in third and fourth. The engine feels strong at the bottom and in the mid-range, but we felt the top end could have been stronger. The Stunner has always been a strong performer, and its engine feels refined and peppy but vibration tends to creep in at high revs. The gear ratios are adequate, and thanks to its five-speed gearbox the Stunner feels more relaxed as compared to the Phoenix's four-speed unit. It also uses the universal one-down, four-up shift pattern as compared to the all-up shift pattern the Phoenix uses. In our performance tests the Phoenix managed to sprint to 60kmph from standstill in 6.8 seconds flat, before running out of steam at 95.75kmph on the VBOX. The Stunner is quicker, hitting the 60kmph mark in 6.2 seconds, and hits a top speed of 99.3kmph. That said the Phoenix feels sprightlier in city, and feels more frantic than the Honda while cutting through traffic. The Honda true to its dimensions feels more long legged and relaxed in comparison. Coming to fuel efficiency, the Phoenix managed to return 59.6kmpl in city as compared to the Stunner's 63.9kmpl, whereas on the highway the TVS turned out to be more efficient, returning an impressive 75.1kmpl as compared to the Stunner's 67.2kmpl. That makes for an overall figure of 63.47kmpl for the Phoenix, as compared to the Stunner's overall figure of 64.7kmpl. Ride quality is another crucial department and both bikes in question do not fail to impress. The Phoenix uses a set of Series Spring shock absorbers at the rear which employ two single rate springs separated by a PU separator. This makes it plush over bad roads and potholes, but does not mean the bike loses confidence around corners. It feels planted and composed, and impresses with its agility. The Stunner on the other hand hinges towards sportiness, but does not lose out on comfort in the process. As for the Stunner's sportiness and handling, I have no doubts about its credentials since I have raced the bike in the national championship and am well aware of its abilities and the ease with which it changes character. It is arguably one of the best handling 125s even today, and feels spirited  be it in traffic or when leaned over around a fast corner. The Phoenix on the other hand had impressed Shumi and me with its dynamics on the TVS test track  it was confident around the one fast corner there and felt similar on street too. Tip it in around a fast corner and the bike feels planted, and does not lose its composure. In city it feels light and zippy, and has no trouble slicing through traffic. At high speeds however, it is the Honda that feels more confident and composed. The Phoenix tends to feel a bit flighty at speeds, which robs you of some confidence. The tyres on the Phoenix are better than previous TVS commuters, but I felt there's still some room for improvement. The Stunner's tyres are more confidence inspiring in comparison, and never on the Stunner did I feel the need to back off around a fast bend. The Phoenix uses a 240mm petal disc brake upfront, which offers enough bite but feedback is soft and progressive keeping in mind that even today users in the segment are scared of disc brakes. The Honda in comparison feels sharper, surer and is quicker to respond as well. TVS' Phoenix does everything well enough for it to be a credible 125cc option in the market. But coming last, more or less, into the segment and from a company as innovative as TVS, we were expecting more than just a well-benchmarked motorcycle that is effective but not outstanding. The Stunner in fact is a good example of what I'm saying. It too is an effective, non-outstanding 125 but it takes the game forward by combining good tyres and an excellent chassis with sporty design to promise and deliver a feeling 125 that is a bit more zingy than your average commuting 125. The Phoenix is cheaper. It also comes loaded with features like the all-digital instruments and so forth. But the more I rode both the motorcycles, the more I realised that if I really wanted a simple, no-complications 125, Honda makes the excellent Shine with the same mechanicals as the Stunner, fewer gizmos and a price tag of Rs 58,187, ex-showroom, Chennai for the fully loaded version with electric start and a disc brake. And if my budget allowed me a more fancy 125, I'd go for the Stunner, cheerfully accepting the Rs 1600 premium I'd have to pay for it. And if I wanted significantly more power, I'd have the Discover 125ST. There isn't a single reason I can think of how the Phoenix stands out as a great alternative to the 125cc offerings currently in the market. To stop rambling, the Phoenix is a good 125cc motorcycle with excellent pricing, but I'd take the Stunner over it.